The song of yesterday’s Soundtrack is from a compilation with Beatles covers, that I did many years ago. 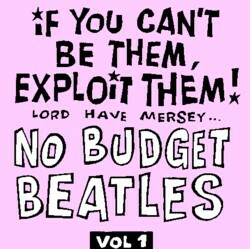 I called the CD No Budget Beatles because most of the 26 songs come from cheap and exploitation labels, that tried to cash in on the success of The Beatles. They did this by releasing records that sound (a bit) like the real Beatles and by using band names and pictures on the sleeve that look like the real Beatles. I find it hard to imagine that this was worth the effort. How many people have bought these records?! Without doing much effort I collected enough different Beatles exploitation vinyl to get the impression that there was a large market for this stuff. But did people buy these records without knowing that they got a (poor) imitation of the real thing? Or didn’t they care? I like these records because listening to them makes me realise how miraculous The Beatles were. Even the best imitations lack all the magic that the real records have. And some of the guys on these exploitation records must have been better musicians than the Beatles were. Here is one of my favourite tracks from this compilation, by a band whose name let no doubt about their intentions: The Ripoffs. But of all the bands on the CD they come closest to The Beatles. At least, as far as I can judge that as a Beatles hater. You’ve only written 24 entries about the beatles, (I typed beatles in the search box). I think you can do better hating them! Agree Arjan, Frits is not a hater but a badly hidden Beatleslover! “Each man kills the things he love”, as they say.